Once upon a time, there was a young, musically gifted man from Florida named Justin, and Justin was a gay Christian. His name doesn’t really matter, though, because stories similar to his have played out many times before. Justin grew up in the Presbyterian Church In America (PCA) — the ultra-conservative wing of the church, not to be confused with the mainstream PCUSA — and was hired as the music director for a PCA church called Faith Presbyterian Church. The specific location isn’t important. Similar stories could play out (and have) in many churches of many denominations across the United States. “As you know, the Session is compelled by God to shepherd the flock he has entrusted to us. (1 Peter 5:1-5) This is a matter we take very seriously. You remain a member of Faith Presbyterian Church. We hope you have not forgotten that we love you very much. In the name of the Presbyterian Church In America, you are hereby indicted on the charges of living out a lifestyle of sexual sin and falsely promoting this lifestyle as being in accordance with the Scriptures against the peace, purity and unity of the Church, and the honor and majesty of the Lord Jesus Christ, as the King and Head thereof. Sounds serious! The church called for Justin to appear before their session meeting this past Monday night to respond to these charges. He did not attend. Below is the text of the letter (click to embiggen) in full. Meet me below, because you may be familiar with this story, as it’s starting to go viral. However, some elements of the story are being reported incorrectly, so there are some things we need to clear up. Also, I’ll attempt to give you an explanation as to what the hell this bizarre practice of “church discipline” is, if you’re fortunate enough to have made it this far in life without being made aware. The “deep love” shown by these people — fundamentalist Christians tend to believe in a type of “love” that repels normal people with morals — knows no bounds. Their “deep love” compelled them to commence “church discipline” with Justin, who hasn’t been active in this church for over two years. I spoke with Justin on the phone the other night, and he cleared some things up about his story. It has been reported that the church outed him, and the way their letter reads, it does sound that way. However, that is simply not true. Justin told me that, when he was hired, he made the powers-that-be at the church aware of his sexuality, and they decided to essentially look the other way. He was single at the time, and he thinks they were under the impression that he planned to stay that way. He worked there for a while, but eventually ended up leaving the church and moving almost three-thousand miles away. At this point, Justin wasn’t too keen on participating in a religious congregation that would condemn him for who he was, so needless to say, he didn’t seek out a new PCA church in his hometown. Over the next two years, Justin stayed friendly with a few of the people from that church, and that led to a recent tense conversation with a ruling elder from the church, somebody he also considered to be his friend. You see, Justin was dating somebody at the time, and made no secret of it. So it was that, from three-thousand miles away, that ruling elder contacted him about his breach of PCA rules and regulations. Justin asked the guy (it’s a guy — the PCA doesn’t allow women to do so much as teach Sunday School without a man present) if this was a friendly call or an “official” call, to which the elder replied that it was a little of both. Before, Justin had been under the impression that the PCA would let him leave in, as he put it, “quiet disgrace,” agreeing to disagree about doctrine, his sexuality and what have you. It seems, however, that it’s easier to leave the Mormon or Catholic churches than it is to get your name removed from the PCA rolls, even from three-thousand miles away. Church discipline is the biblical process of confrontation and correction carried out by individual Christians, church leaders, or the entire church body when a member of Christ’s body is involved in a matter of open sin. Some Christian denominations use the term excommunication instead of church discipline to refer to the formal removal of a person from church membership. The Amish call this practice shunning. Church discipline is meant specifically for believers involved in overt sin. Scripture gives particular emphasis to Christians engaged in matters of sexual immorality , those creating discord or strife between members of the body of Christ, those spreading false teachings, and believers in outspoken rebellion to the spiritual authorities appointed by God in the church. Paul explains in 1 Corinthians 5:5 that this final step in church discipline is a way of handing the unrepentant brother “over to Satan for the destruction of the flesh, so that his spirit may be saved on the day of the Lord.” (NIV) So, in extreme cases, it is sometimes necessary for God to use the devil to work in a sinner’s life to bring him to repentance. When I spoke with your representative (kept nameless not for lack of caring but for consideration for his privacy), I expected a peaceful, kind-hearted parting of ways. I did not expect an indictment, to be sure, and I surely did not expect one so mind-bendingly cold and unnecessarily severe. It seems you believe I am destined for hell – never mind the near tiptoeing around the implication, because I know as a PCA “covenant kid” what is meant by “God’s teaching on marriage relates to the very core of the gospel and our hope of eternal life.” I’m shocked you had the gall to actually say it, to be God’s mouthpiece of salvation. I would like to here let you know that I had every intention of leaving peacefully. For me, agreeing to disagree was enough. I spent the better part of two years away from FPC, living my life exactly as I do now without a single word from you. It baffles me that out of the blue you would decide that now is the time to make a big deal of this. I am the same Justin that served in your church for two years. I am no more gay now than I was then. When I left, I assumed that we had disagreements, but I also assumed that because of the good terms we were on, I wouldn’t hear any more – that I could leave in “quiet disgrace.” When your representative called, I asked that my membership be removed peacefully, that I would not blame you or make a fuss. Apparently, you care more about following protocol than for the people in its wake. When I opened your letter, I barely made it past the very first sentence. To even frame the entirety of my life using the phrase “homosexual lifestyle” proves an insane tone-deafness to those other than yourselves. I do not live a homosexual lifestyle any more than others live a heterosexual lifestyle. This is a tired argument, and yet it still needs to be made. If this is what you plan to “charge” me with – living the life I’ve been given – then yes, I am gay and I am not ashamed of this fact, nor can I change it. It is true that I was in a dating relationship with a man. Where is the sin here? Does sin start at feelings? At holding of hands? The vagueness of your “concern” over my relationship only further proves your overall unwillingness to believe I am even capable of such a thing as purity in love. We then come to the most hurtful thing in the entire letter. “We hope you have not forgotten that we love you very much.” Just an aside. A token. A conscience easer. To literally close the door in my face, to not just question but outright DENY my salvation, to take two years of service I gave to your church and spit on it…and then to say you’re doing it out of love. My tone may be harsh. Believe me when I say it could be far worse. Lest you think I misunderstand you, I know that you believe yourselves to be acting only how you are commanded. Your hands are tied. This is no joy, merely a necessity. The problem is you cannot deny me the ability to love and be loved and treat it as a minor inconvenience to yourselves. If you want to know why so many people think the church is unwelcoming and unloving toward gay people, THIS is why. You are saying, rather explicitly, that I and people like me are not welcome. What was my crime? I loved. I was loved. I am capable of love. It is abundantly and sadly clear that you do not understand this. You ask me to either live a lie or live in shame. If I cannot provide my own shame to live under, you will take action to shame me by force. This is not because you want this to be my life. This is because it is what you believe is decreed to be my life. My being gay has barred me from the joy of union either with a life partner, or with the body of Christ as you manifest her at FPC. Forgive me, but after seeing how you treat those like me, I choose the latter. “If these reports are true, we consider these sins to be general and public in nature.” Then let it be so. If my life is to be laid bare, so are your actions. I lived in peace, asked for peace, and strove for peace. You bring me a rod for my beating and call it love. This is one wound too many. To borrow some of your grandiose language, I hereby denounce the PCA, its disregard, nay its contempt for God’s LGBT children, and its twisted and unscriptural view on salvation as it relates to marriage. Let me be found GUILTY AS CHARGED. And then he dropped the mic and walked offstage. I have a bit of experience with the PCA. Like Justin, I used to work in music ministry at one of their churches. The only thing that surprised me about his story is that they actually did know he was gay the whole time, only deciding to use that fact as a weapon years later. It’s very common for churches that believe homosexuality is a sin to look the other way and pretend they don’t know that their music minister or organist is gay, but my experience with the PCA suggested that they followed a much harder line than that. When I was on staff, we were hiring a full-time organist, and as this was a ridiculously wealthy church, it was a sought-after position. It was, of course, a prerequisite that the person they hired be a Christian and pass through this hoop or that to prove that they were spiritually in line with the church. The weird part is that, as applications started to pour in, they started a “gay pile,” for applications from men above a certain age who were unmarried. They were so concerned that they might accidentally hire a gay that they wouldn’t even look at these applications. Subconsciously, I knew that I wasn’t all that far off from coming out myself, which is probably why I remember it so vividly. A still, small voice started telling me that I needed to get the hell out of there. Luckily, though my family had gone to that church when I was in high school, and though I worked for them after high school, we had never joined the church, so I didn’t have to deal with all the crap Justin’s going through. 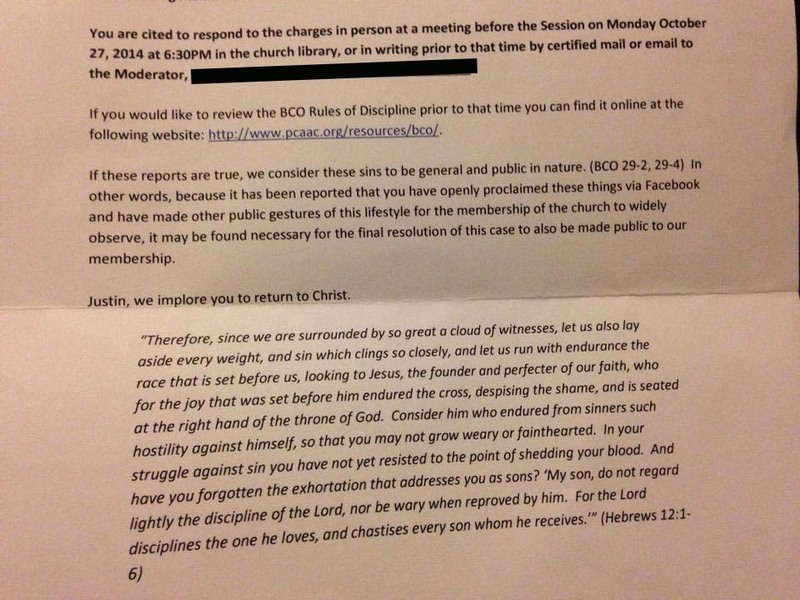 Aside from the fact that it’s PCA protocol, one wonders why, in this specific instance (I can’t say two years later and three-thousand miles away enough), did the church feel the need to address the situation this way? Why couldn’t they just let bygones be bygones, with both parties going on their merry way? Why were they seemingly okay with Justin working there as a gay person, but suddenly now having a huge problem with it? Another detail that Justin shared with me may be a small clue, indicative of a much larger thing happening in conservative churches these days. Justin worked under a different PCA pastor when he was there. He doesn’t even know the guy who currently holds the job. Could it be that both pastors adhere to PCA doctrine, but one is more in touch with the reality of the world than the other? Earlier this week, we noted that Russell Moore, president of the Southern Baptist Church’s Ethics and Religious Liberty Commission, stood on stage at a Baptist conference on homosexuality and disavowed “ex-gay” therapy, condemned anti-gay bullying and called the epidemic of gay teen homelessness a “human dignity” issue. At the same conference, Erik Stanley of the virulently anti-gay Alliance Defending Freedom hate group stood on the same stage and claimed that Matthew Shepard’s murder was not a hate crime. Meanwhile, during this time, pro-gay Christians at the conference met with some Baptist leaders and started a conversation that they hope will bear fruit in coming years. We noted that nothing about the Southern Baptist Church’s beliefs on sexuality has changed, and that the church is still a very dangerous place for LGBT people. But cracks are starting to develop in the foundation. Those religious leaders with a sense of nuance and a grasp on reality can no longer pretend that they don’t notice that LGBT people have been deeply wounded by the church. Those with eyes open realize that the “ex-gay” movement has been discredited beyond repair, that it has absolutely no basis in reality, and that it has a long track record of sending people into deep spirals of depression and, tragically, suicide. No rational, feeling human being can acknowledge that track record and continue to support the “ex-gay” movement. No rational, feeling human being can watch conservative Christian parents disowning their gay kids and kicking them out on the street and judge that act as anything but evil. I noted in that press release that the most important parts of this discussion about equality and inclusion are no longer happening in the mainstream public consciousness. The public, as it were, already supports full equality. Marriage equality is sweeping the nation, and despite a few dead-end governors wasting their citizens’ taxpayer dollars trying to forestall the inevitable, it’s being greeted with little more than a shrug. Sure, there may be 40 or 45 percent of the public that, at least going by the poll numbers, are against it, but one gets the sense that the anti’s just don’t care that much anymore. Thousands and thousands and thousands. You just never see any of them. Or meet them. Or talk to them. But there are thousands. Trust Greg. Look, when you have Southern Baptist leaders and Republican governors like Chris Christie admitting your snake oil is just that, it’s time to move on and apologize, not double down. This game is over. Indeed. But that’s the entire point I’m getting at. The true divide, the true developing chasm, is between conservative Christians who are struggling and wrestling with this issue — the ones who don’t want to be hateful, who don’t gay kids to be homeless, but they believe that homosexuality is sin, etc. — and the dead-ender, hate-mongering hardliners like Bryan Fischer, Greg Quinlan and Matt Barber. Those men and others like them will likely live out their lives, watching their allies die, never to be replaced, and eventually die themselves, and with that, their movement. But millions of conservative Christians will evolve, slowly but surely, and one day they’ll forget there was ever a time when they didn’t accept LGBT people. Their kids will be leading the way. Almost half of Millennial-aged Evangelicals support marriage equality, and a third of Gen-X Evangelicals support it. Those numbers are only growing. It won’t be that long before a majority of both groups is on our side, and that majority will eventually be making the decisions in their churches. In an individual church, it’s usually easy to pick out the dead-enders, but it can be harder to figure out which ones are are having that conversation with themselves, which ones are truly wrestling with the issue. In the case of Justin and his previous church, it may be that the earlier leadership of the church was quietly starting to grapple with this issue, and decided to let Justin be. The new pastor might be a dead-end Bryan Fischer type. We don’t know. But that’s part of why Justin didn’t feel the need to call these folks out by name. For one, he’s a decent guy and he doesn’t want anyone bombarded with hate mail. But at the same time, he doesn’t want to alienate people who might be slowly but surely moving a little bit closer to acceptance. The takeaway here, and why Justin wanted to share his story, is that these sorts of cases of abuse of LGBT people at the hands of the church are still very much happening, and these stories need to be exposed to the harsh light of scrutiny. But at the time, things are starting to slowly change. For one, anti-gay churches can no longer expect to be able to conduct themselves this way without being held accountable in some way. No longer can they pretend that this is not an issue that directly affects them. It’s going to become more and more difficult for them to pretend that they don’t know they’re inflicting abuse on their own parishioners. If a Southern Baptist leader as senior as Russell Moore sees it, one expects that there are many more in the pews around this country who are starting to see it, starting to see that their policies, their handling of this issue, is leaving a trail of wounded people. 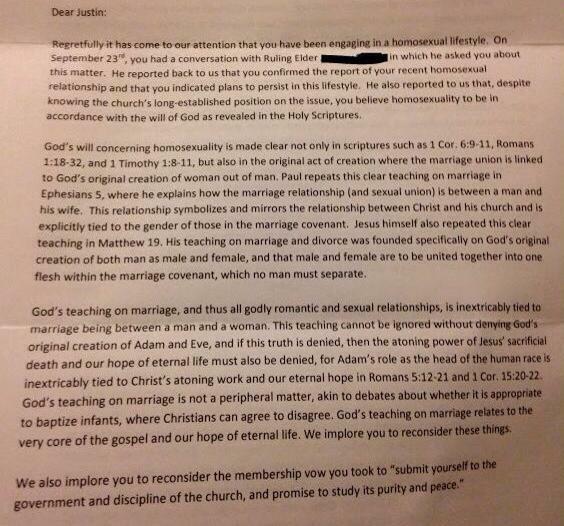 Justin’s letter, and his publication of the letter sent by his church, are intended as a wake-up call for any who sit in the pews of that church, and other PCA churches, who have ears that can hear and eyes that can see. Because we know those people are there. As the cracks in the foundation of religious anti-gay bigotry start to spread, conservative Christians will be forced to make a choice. Will they side with unhinged, uneducated hate disguised as faith, or will they side with love, their own family members and the actual teachings of their religious faith’s namesake?